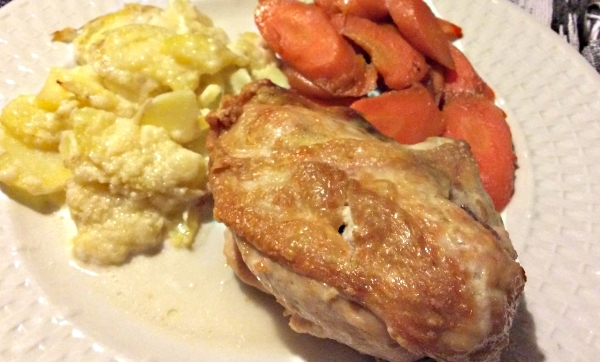 The key to making this dish of chicken with dauphinoise potatoes and Vichy carrots is to not overcook the chicken. Seriously. The plate I served first was great. The chicken skin was incredibly crispy (it’s nice to finally learn the secret of making crispy chicken! ), the chicken itself was moist (I tend to prefer dark meat exactly because breasts are often too dry) and the sauce was just delicious. I only really got to eat my daughter’s leftovers, but I couldn’t help moaning while eating them. I reserved the second serving for my husband, who was walking the dog while my very hungry daughter ate. I left the chicken breast in the oven (turned off and with the door open), where it dried up and I was reminded of why I hate white meat. My husband, who likes chicken breast, wasn’t impressed either. Once I ate his leftovers, I understood why. So, if you make this kit, make sure to not overcook the chicken and not leave it in the oven to remain warm. I also really enjoyed the dauphinoise potatoes – and there were enough for the three of us plus leftovers -, but they didn’t keep well. The next day they lacked in flavor. But hey, you are not going to eat them the next day. Finally, everyone enjoyed the carrots (I didn’t try them as I don’t like carrots). All in all, this was a much better meal than you would expect. However, it was also more laborious than the other two I got that week, and it took far longer to prepare. Now, for the secret of having super-crispy oven-baked chicken: first preheat oven to 400F. Then saute the chicken breasts on olive oil over medium-high heat for 2-3 minutes per side. Then place on a baking sheet and put in an oven for 24-28 minutes. I got my first week of Home Chef at a discount, so I paid only about $8 for this meal. Regular price would be $20 – which is a better deal than other home meal kits. On a saute pan, simmer ingredients together until the sauce thickens, 2-3 minutes. Serve.